China Miéville looks at the Revolution as a hopeful flashpoint that briefly showed the promise of socialist transformation, before descending first into an authoritarian nightmare and then today's corrupt capitalism. Written with an urgency designed for our era of struggle absent clear political ideologies or unified mass socialist organizations, Mieville focuses on the revolutionary moment, using his skill as a story teller to see the participants in real time. THE CENTENNIAL of the Russian Revolution of 1917, the most important political upheaval since the 18th century, passes by quietly. In Russia, Vladimir Putin’s crony capitalist regime certainly has no plans to commemorate the event. The situation in the West isn’t any more favorable; after the Berlin Wall crumbled in 1989, the consensus has been that Marxism is dead and buried as a political force. The recent death of Fidel Castro marked the passing of the last of the truly iconic communist leaders. The Middle East is today the world’s hotbed of revolutionary turmoil, but aside from some Kurdish groups, the insurgents follow the dark banners of radical Islamism, not the red flags of proletarian struggle. Even among leftists in the United States, the emphasis has shifted from class struggle to identity politics — despite the fact that the White House is currently occupied by the crudest possible personification of casino capitalism. Against these prevailing winds, China Miéville bravely launches October: The Story of the Russian Revolution — a recasting of the Russian Revolution as a captivating narrative. October is just one of a slew of books released by the left-wing publishing house Verso to commemorate the 100th anniversary of the Bolshevik uprising. Included in the roster are new works by radical veterans Tariq Ali and Slavoj Žižek that reassess the politics and persona of Vladimir Lenin. But Miéville’s book is likely the most popular and accessible in the stack. This isn’t a book dense with Marxist theory or analysis — even if it is somewhat dense with political party abbreviations and participant names. Instead, it looks at the Revolution as a hopeful flashpoint that briefly showed the promise of socialist transformation, before descending into a totalitarian tragedy. It is written with a special urgency designed for this era of struggle without clear political ideologies, when people throw around the word “revolution” without offering blueprints or even the most general directions. Miéville’s wonderfully strange, highly imaginative novels, which combine fantastical hallucinations with sociopolitical commentary, have made him a cult favorite among fans of speculative fiction. To give you a sense of his method, the 2016 novella The Last Days of New Paris conjured a French capital besieged by surrealist guerrillas and invading Nazis, with both sides using a cocktail of imagination and black magic to unleash living surrealist artworks and dark monsters to battle each other. (Hitler’s cameo is a particularly brilliant moment.) In October, Miéville, whose PhD dissertation offered a Marxist theory of international law, joins a hallowed group of science fiction and fantasy authors who have applied their talents to history. It belongs on the shelf beside H. G. Wells’s A Short History of the Worldand Isaac Asimov’s The Greeks. But October’s closest parallel is journalist John Reed’s classic Ten Days That Shook the World, an eyewitness account of the Bolshevik Revolution that still resonates with romantic energy. Ten Days, however, was written before the Revolution played itself out in Stalinist terror, and before the advent of the Cold War. Miéville’s is a new history that dreams, but doesn’t dismiss the nightmare. Lenin is introduced as a man who “compels, even transfixes, in print and speech, by his sheer intensity and focus.” Trotsky is “charismatic and abrasive, brilliant and persuasive and divisive and difficult,” an intellectual capable of militant ruthlessness. Stalin, meanwhile, is introduced through haunting, third-party glimpses; individuals remember him as no more than a “grey blur,” or as “looming up now and then dimly and without leaving a trace.” Because Miéville is so narrowly focused on the moment, seldom shifting into the near future and never to our own era, these passages have a special power; we feel we are seeing these figures in real time, yet we can’t help bringing the future to bear on them. As Miéville tells it, the Russian Revolution was an apocalyptic moment. The inferno of World War I unleashed a civil war between the downtrodden and their overlords. Social breakdown fueled spontaneous, popular mobilizations. The masses formed “soviets,” councils of popular power. Liberals and radicals squabbled endlessly over what to do, while Lenin, returning from exile, wrote explosive texts like the April Theses, which called for the destruction of the old state. Dark forces like the anti-Semitic Black Hundreds stalked the land, carrying out pogroms with the tacit approval of the tsarist regime. Restless peasants started looting their master’s homes and burning down their estates. The situation couldn’t hold, and the Tsar was overthrown. But the real battle, which consumes most of the book, is between the various factions vying for power, ranging from the radical Left Socialist Revolutionaries (SRs) to the more moderate Mensheviks and, of course, Lenin’s Bolsheviks, who modify (or dismiss) the old Marxist theory of historical development through well-defined stages and urge for an immediate socialist revolution. Like any good storyteller, Miéville revels in the phantasmagoric aspects of this true tale. As factions battle in the streets during the “July Days,” Russia’s middle and upper classes fall into a nihilistic decadence: “[T]here flourished a millennial indulgence. Bands and all-night dances, stained silk dresses and cravats, flies circling warming cake and vomit and spilt drink.” Miéville also indulges us with fascinating anecdotes fit for any thriller. In one suspenseful but comic moment, Lenin is hiding, disguised as a peasant in the woods, when a tired Cossack arrives and announces he is searching for “someone by the name of Lenin. To bring him back dead or alive.” The fugitive revolutionary spends the night chatting with his hunter before seeing him off. The achievement of October is to make this history fresh and urgent. The age of communist revolutions may be a distant memory, but the drive for social change, be it peaceful or violent, is not. Reading this book brings to mind the Arab Spring of 2011, in particular the Egyptian Revolution. The sequence of events in Tahrir Square were similar to what Miéville describes here — the key difference being that there was no Lenin or radical left-wing party to uproot the old system. Two Egyptian governments were overpowered by the military leviathan they thought they could tame. At one point in October, Miéville echoes Trotsky’s ominous analysis: if the right-wing elements in the Russian military had managed to overthrow the Bolsheviks, then “[n]ot the Italian language, but the Russian would have given the world the word for fascism.” As he admits at the outset, Miéville has his “villains and [his] heroes” in the piece. “Though not, I hope, dogmatic or uncritical,” he writes, “I am partisan.” This admission is refreshing, and, for the most part, correct. Interestingly, however, he does leave one important moment out of his narrative: the execution of Nicholas II and his family. What lies behind this choice is hard to say, but it is akin to writing about the French Revolution and leaving out the beheading of Louis XVI. Soon after the events Miéville describes, the Russian Revolution shifted from hope to despair. The book’s finest moment might be its epilogue, which is a requiem for the promise of October. Besieged and invaded by hostile powers, and giving up plans for a continent-wide revolution, the Bolsheviks carried out their own “Red Terror” and Soviet Russia morphed into a monolithic one-party state. The dream of an ideal communist society gave way to Lenin’s New Economic Policy, which brought back limited capitalism to bolster an economy devastated by the Russian Civil War (1918–1921). Lenin’s death signaled the rise of Stalin and the age of show trials, the Gulag, and what Victor Serge called “midnight in the century.” One thinks of Syria, once gripped by revolutionary fervor and now trapped in a bloody midnight of war and torture chambers. Still, unlike other admirable histories — such as Orlando Figes’s A People’s Tragedy — Miéville’s book emphasizes the hope that the Russian Revolution inspired. “Twilight, even remembered twilight, is better than no light at all,” Miéville eloquently observes. Revolutions are easily deformed, and often devour their children. This is the tragedy now playing out in Venezuela. Once the regenerator of the revolutionary dream, the country now approaches an abyss that could trigger a civil war. And yet October’s dramatic narrative makes the case that the effort is still worth it — that we must dare to dream, even if we risk conjuring more nightmares in this darkening world. 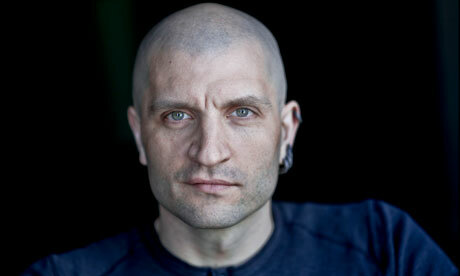 Author China Miéville is the multi-award-winning author of many works of fiction and non-fiction. His fiction includes The City and the City, Embassytown and This Census-Taker. He has won the Hugo, World Fantasy, and Arthur C. Clarke awards. His non-fiction includes the photo-illustrated essay London’s Overthrow and Between Equal Rights, a study of international law. He has written for various publications, including the New York Times, Guardian, Conjunctions and Granta, and he is a founding editor of the quarterly Salvage. A recent extended interview between Mieville and the United Kingdom's journal Historical Materialism about the book appears HERE.